169. 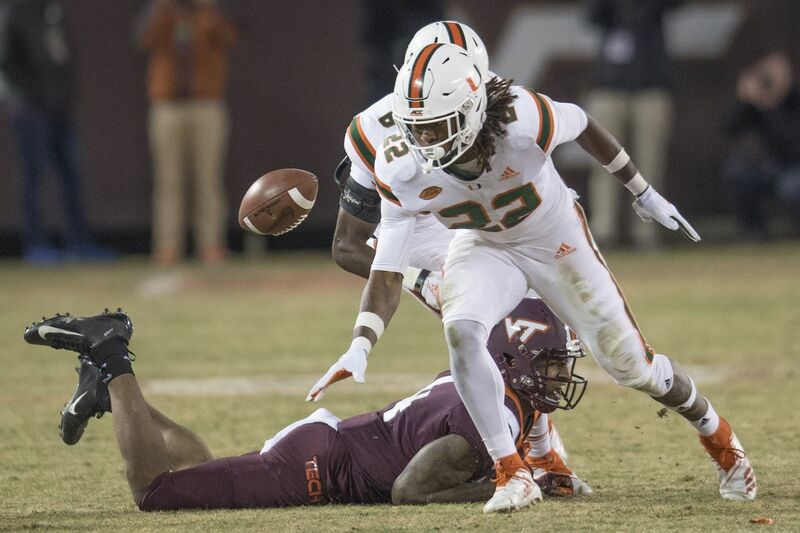 Sheldrick Redwine - S - Miami - 6'-0" 196 lbs. - Nice combination of speed and physicality. A CB turned S, still feeling his way in his new position, team will need to coach him up. I am grateful for your work man. The number of players you reviewed is really impressive. I am just trying to keep up on who they may draft and why. It makes the draft more fun to watch. I am sure I will be looking back to your work on draft day. I imagine they would be looking at Redwine to ascertain if he could be developmental redshirt type. I wondered if a midround contract (wanting a large FA contract) and a redshirt year or two behind Talib and Weddle would help him. Maybe CB would help focus, especially man to man. They need some DBs to groom with Peters, Countess, Hill being in the last season of their deals and Talib and Weddle up in years. Former Miami Hurricanes safety Sheldrick Redwine excelled on Monday at the NFL Combine. Redwine is projected to be a late-round selection next month but could move up after his performance on Monday. Former Miami Hurricanes safety Sheldrick Redwine drastically improved his NFL Draft stock on Monday during the final day of the NFL Combine. Redwine posted excellent numbers in both the field and speed drills at Lucas Oil Stadium. Redwine participated in four of the seven field events on Monday. The Killian and Miami alum had a 4.44-second performance in the 40-yard dash, 39-inch leap in the vertical jump, 130 inches in the broad jump and ran a 4.14 20 yard shuttle. Redwine’s production scored high on Monday. He finished with the sixth-best time recorded among safeties and 10th best when cornerbacks were included in the 40, the fourth-highest among safeties and eighth best among all defensive backs in the vertical jump. Redwine continued to impress by finishing a very respectable tenth among defensive backs tied with former teammate Michael Jackson in the broad jump and third among safeties. Redwine was sixth in the 20-yard shuttle among safeties and 15th among all defensive backs. Redwine outshined his Killian and Miami teammate Jaquan Johnson. Redwine posted much better numbers at the combine. He has always played in Johnson’s shadow. Johnson led the Hurricanes in tackles each of the past two seasons and was arguably the best playmaker on one of the nation’s best defenses. With Jackson, Johnson and Redwine leading the secondary, Miami finished fourth in the nation in total defense and first in pass defense in 2018. The Hurricanes 135.6 passing yards per game against was more than ten yards better than any defense in FBS. Johnson and Redwine are expected to be fourth-round picks in next month’s NFL Draft according to NFL Draft analysts Daniel Jeremiah of NFL.Com. Jeremiah spoke to the Miami Herald about Redwine’s projections. “A real physical, sure tackler— excellent blitzer"
Redwine adjusted exceptionally well switching from CB to safety for his Junior season at Miami. His versatility should help him in the NFL. During his final two years as a starter, Redwine finished with a combined 123 tackles, six tackles for loss, 5.5 sacks, five interceptions eight passes defended and three fumble recoveries. Redwine was named honorable mention All-ACC as a Senior with Miami. At 6’1 195 pounds with the speed and agility, he showed at the combine, Redwine should be a player to watch when Miami holds its pro day and when the draft arrives in April in Nashville. Edited 3 time(s). Last edit at 04/12/2019 11:18AM by Rams Junkie.